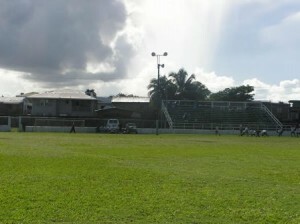 Home » Miscellaneous » Public space and sports collide; football field or concert ground? Public space and sports collide; football field or concert ground? IndigeNOW Belize, a world indigenous music festival organized by the National Institute of Culture and History, is scheduled for next weekend at the MCC Grounds. The event promises a who’s who of local and international artists, as well as dance performances and arts and craft. But while planners have meticulously organized the showcase, the Football Federation of Belize has expressed its displeasure with the National Sports Council for granting approval to NICH to use the football field. In a press release issued this afternoon, FFB president Ruperto Vicente noted that the concert will lead to damage of the playing pitch, subsequently risking the safety of athletes who will also use the facility that weekend. While the MCC Grounds is managed by the Sports Council, Vicente told News Five that the sporting complex, the only official football field in Belize City, is in the process of being adopted by the FFB. This is the problem with Belize, things are never done right or for the correct reasons. This event can be held at the ITVET on Freetown Road without any problems. They have got to stop using MCC for these events, someone has to bite the bullet and set down their feet or do they even care? Another thing, NICH seems to put off events without any thought as to what exactly they want to achieve! Look at the event done with the sculptors last year, the pieces are still sitting on the compound, a testament to waste of time and money! Now an indigenous festival should feature INDIGENOUS music, since when is Instruments of Love and Ascenthium indigenous music? No brukdong music? Why has no one been charged for Kaylee Burgess’ murder? PM returns from IDB and IMF meetings; partial guarantee in sight?